These findings were published in Nature Communications in 2016. Yao M et al. The mechanical response of talin. Nature Communications. 7. 11966. doi: 10.1038/ncomms11966. More information on the Yan Lab. Figure: The schematic depicts the extension of talin due to stochastic unfolding of its rod domains. The length to which each talin molecule extends depends on the forces acting on it as well as its binding to focal adhesion components like vinculin and actin cytoskeleton. However, regardless of the length of talin extension, the force across the molecule remains stable at 5-10 pN. Talin is a key component of the focal adhesions that links the ECM-matrix contacts to the cellular cytoskeleton. 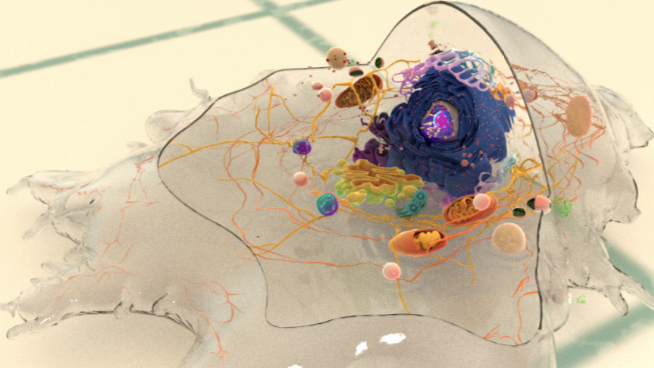 It functions as a mechanosensor that senses and relays extracellular as well as intracellular forces to bring about a cell-specific mechanoresponse. The mechanosensing functions of talin is mediated by the stochastic folding and unfolding of several or all of its 13 rod domains (R1- R13) in response to forces, which influences its binding capabilities with other FA components like vinculin and the actin cytoskeleton, and leads to rapid fluctuations in its end-to-end distance. However, force fluctuations that occur along the length of talin during force transmission remain uncharacterized. By combining experimental data from single molecule manipulation studies with numerical simulations, this study demonstrates that the average force along talin remains stable between 5-10 pN, irrespective of the unfolding state of the rod domains and lengths to which talin is extended. This reveals a novel function for talin as a cellular force buffer that can set the force range to within a physiological level, at which enables a number of mechanosensitive cellular functions can occur. What are the functions of talin at focal adhesions? 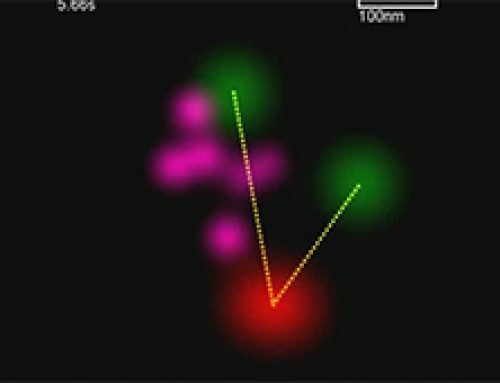 How are single molecules manipulated using magnetic tweezers? Talin is abundant at sites of cell-ECM linkages where it appears to be a key endpoint for multiple signaling pathways that lead to integrin activation. Talin behaves as a prominent structural platform that is required for the initial linkage between the contractile cytoskeleton and sites of integrin/fibronectin adhesion. 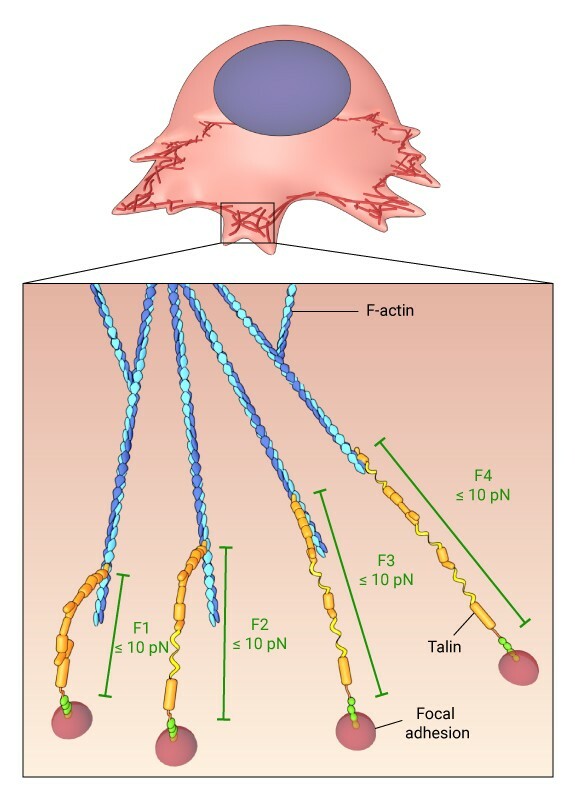 During cell spreading, talin undergoes cycles of stretching and vinculin binding due to contractile forces on the rearward moving actin filaments. This phenomenon serves to convert matrix forces into biochemical signals at the adhesion site. Hence it not only organizes and stabilizes these initial linkages , but it also mediates signal transduction events through the integrins, vinculin, and actin. Focal adhesions are composed of a large number of mechanosensitive and signaling components in their cytoplasmic scaffold. In many cases, mechanotransduction occurs through protein conformational changes in multi-modular proteins that act as molecular switches, leading to subsequent phosphorylation signaling pathways or addition of components under internal/external mechanical perturbation. 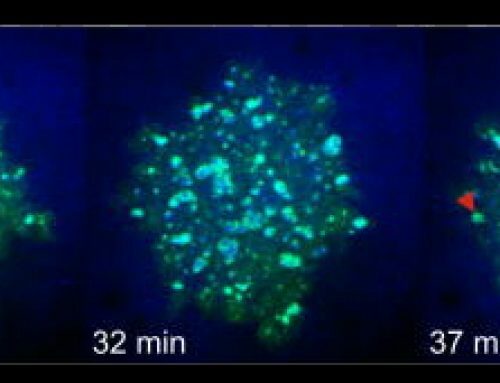 These ultimately affect prominent protein-protein interactions allowing self-assembly and/or remodeling of the adhesion unit. These allow a multitude of possibilities that trigger force-induced signal transduction pathways involving the adhesion components and diverse targets, resulting in cascading events at a distance, such as gene expression in the nucleus. Magnetic tweezers are micromanipulation devices that are able to exert and measure forces on magnetic particles by introducing magnetic gradients. They are emerging as a powerful tool to study biological problems both at the cellular and single molecule level. Tethering of magnetic particles to biological molecules such as DNA and protein allows measurement and probing of their force response. Magnetic tweezers can achieve forces ranging from sub-piconewtons (pN) to nanonewtons (nN). Depending on the setup, the forces generated can be translational or rotational and in certain multiple magnet setups 3D manipulations are also possible. Magnetic tweezers present a robust means to quantitatively apply forces to a system of interest and at a relatively low cost when compared to other micromanipulation tools. Talin full length rods were subjected to a series of force cycles: this involved linearly increasing the applied forces from 0.5 pN to 40 pN and then rapidly reducing the forces to 0.5 pN. Talin rod domains unfolded in a step-wise manner when the force was increased to 40 pN and later refolded to their native states when the force was reduced to 0.5 pN. The R3 domain is the first domain to unfold at 5 pN force, and is therefore considered to be the initial mechanosensor in talin. The R7 and R8 domains of talin rod unfold in a cooperative manner, with a single step size of 80 nm. This is due to the insertion of the R8 domain between the two helices of the R7 domain, which protects it from force-induced extension, until the R7 domain extends at a force of 15 pN. The talin rod domains were classified into four distinct groups, based on the magnitude of force required to unfold each of these domains: group I domains unfolded at a force less than 8 pN, group II domains at 8-15 pN, group II domains at 15-21 pN, and group IV domains at forces greater than 21 pN. The R4-R6 and the R9-R12 regions of the talin rod unfold in three and four distinct steps, respectively, at a force of 15-21 pN, suggesting that all helical bundles in each of these talin domains unfold individually. The extension of talin fluctuates in the range of 50-350 nm due to stochastic catch and release from actin retrograde flow. Simulation of the stochastic unfolding and refolding events of the talin rod domains showed that talin extends from 70 nm (all domains folded) to 250 nm in less than 5 seconds and remains at 250 nm for around half an hour. As talin extends, more and more rod domains unfold, with around 5 domains unfolded at a talin length of 250 nm. The simulation studies also showed that the number of unfolded domains increases with an increase in talin extension. The force levels out at <10 pN even when talin is extended to 400 nm. When the talin domains were unfolded in the presence of vinculin domain 1 (Vd1), 9 of the 13 domains were bound by Vd1 at the vinculin binding sites. These nine domains could not unfold in a subsequent stretching cycle due to vinculin binding. Single molecule manipulation using magnetic tweezers was used to investigate the mechanical stabilities of the talin rod domains and determine the kinetics of their stochastic folding and unfolding events. Kinetic simulations using the Gillespie algorithm was used to estimate the evolution of forces in the talin-mediated force transmission pathway. By providing insights into the mechanics of talin rod domains in talin-mediated force transmission pathway, this study reveals a novel role for talin as a cellular force buffer that sets a physiological force range at focal adhesions that enables cellular processes to take place. By combining structural information with single molecule studies, this study provides a robust method for studying the mechanical response of mechanosensors similar to talin and identify their roles in mediating mechanosensitive cellular processes.